In the previous article (https://guruparamparai.wordpress.com/2012/08/22/nathamunigal/) we discussed about nAthamunigaL. Now will move on to the next AchAryan in the OrAN vazhi guru paramparai. Sishyas: maNakkAl nambi, thiruvallikkENi pAN perumAL araiyar, chEttalUr chendalangAra dhAsar, sri pundarIka dhAsar, Gomatam thiruviNNakarappan, ulagaperumAL nangai. puNdarIkAkshar was born in ThiruveLLarai (svEtha giri) divyadhEsam and was named after the emperumAn of the divyadhEsam. He is also known as padhmAkshar but eventually and popularly became to be known as uyyakkondAr. He was one of the prime sishyas of nAthamunigaL along with kurugai kAvalappan. When nAthamunigaL got blessed with divine knowledge by nammAzhwAr, he came back to kAttu mannAr koil and started preaching our samprAdhAyam from there. He taught ashtAnga yOgam to kurugai kAvalappan – through ashtAnga yOgam, one can do bhagavadh anubhavam non-stop without having to think about any bodily activities. When nAthamunigaL asked uyyakkoNdAr if we wanted to learn ashtAnga yOgam as well – uyyakkondAr said “pinNam kidakka manNam punNaralAmO” (பிணம் கிடக்க மணம் புணரலாமோ) – meaning when so many samsAris are suffering in this world out of ignorance, how can we do bhagavadh anubhavam alone. Hearing this nAthamunigaL was extremely pleased and appreciated uyyakkondAr’s magnanimity. 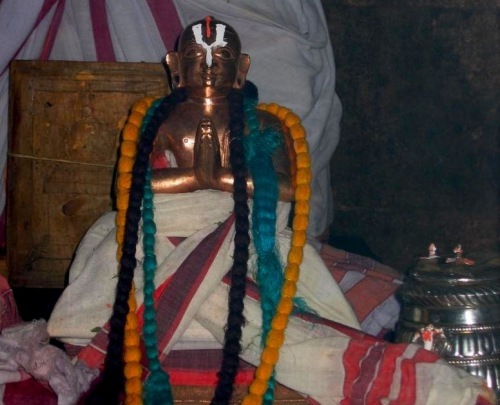 He instructed both uyyakkondAr and kurugai kAvalappan to teach ashtAnga yOgam and aruLicheyal with meanings to Ishvara muni’s son (nAthamunigaL’s own grandson) who is soon to appear. After the time of nAthamunigaL, uyyakkondAr becomes the dharisna pravarthakar (one who is incharge of protecting/propagating the sampradhAyam) and teaches this divine knowledge to his sishyas. At the time of leaving to paramapadham, maNakkAl nambi (his prime sishya) asks him about the successor and uyyakkondAr instructs maNakkAl nambi himself to take care of the sampradhAyam. He also instructs maNakkAl nambi to prepare yAmunaithuraivar to be the next leader. In our next article, we will see the greatness of maNakkAl nambi. This entry was posted in OrAN vazhi guru paramparai on August 24, 2012 by sarathyt.